I've become ever-so-slightly obsessed with finding healthy ways to pig out on foods we all love to indulge in. Like cookie dough, for instance. Mmmm, cookie dough - why is it that it tastes so much better than the cookies themselves? I've pondered the same question for brownies. Maybe more than is normal. There's something illicit about eating brownie batter, and at the same time, nostalgic. And, you know....sometimes unsafe. But fear no more, because there is nothing unsafe about these. No raw eggs. Just raw awesomeness. It takes mere minutes (minutes!) to throw together, and the only problem is that it might take an equally short amount of time before it's gone. I know that this is pictured on a cracker here. But I'll be honest with you - even though I'm calling this a dip, I know you won't judge me if I tell you that I ate most of it straight out of the bowl with a spoon. After all, that's how brownie batter was meant to be enjoyed: unmitigated in its delicious fudginess. Combine everything but the chocolate chips in a food processor and blend until very smooth. Adjust everything to your own taste. Remove to a bowl and stir in the chocolate chips. Keep refrigerated until ready to serve. For best results, eat with a spoon, or serve as a dip with gluten-free graham crackers. First, let me apologize for not posting all that much over the last few weeks - my computer broke and is (allegedly) being repaired. But I've got a ton of awesome recipes just waiting to go up, including Healthy Brownie Batter Dip, Healthy Cookie Dough Dip, Jam Pocket Cookies, Cinnamon-Sugar Rugulach, and Soft Chickpea Wrap Pizza. So get ready for more deliciousness in the weeks to come! In other news, one of my recipes was featured on the blog of the Australasian Baker, the National Baking Industry Association of Australia!! Click here to see the post. It will also be appearing in their print magazine! It's hard to conceive of people on the other side of the world looking at my blog and trying my recipes, but it's a huge honor to have been featured! I don't think this created an aversion to eclairs specifically, but it certainly didn't fuel any desire in me to seek them out, either. To this day, every time I hear the word, my thoughts go back immediately to that classroom. Before I know it, other long-forgotten calculus vocabulary words like "derivative" and "integral" begin to creep back into my consciousness. You know, it's a bit unsettling for a baked good to have such a strong association with high school math. This month's Ratio Rally assignment was a true departure for me. So far, we've been exploring ratios behind baked goods that are at least familiar to me - muffins, scones, pancakes, etc. But Pate a Choux? I can't even pronounce that. I don't have a keyboard that will type it correctly with the accents in the right places. It makes me start to sweat a little. But you know what? But even though it sounds super fancy, Pate a Choux is probably something you have eaten before. (Funnel cake, anyone?) And it is not nearly as scary as it sounds (or looks). It's an incredibly versatile batter, and I thought for a long time about what specifically I'd like to make. Cream puffs? Gnocchi? Beignets? Fried Doughnuts? Funnel cake? The more I researched, the more possibilities there seemed to be. I started to sweat a little again at the overwhelming number of options. But in the end, I saw this month's Ratio Rally as a chance to redefine what eclairs are to me. To let them out of the confines of calculus memories. To deshroud them. To bring them back to life. And I am so glad I did. And I'm glad that the Ratio Rally has branched out into this lesser-attempted feat of baking. I will say that this is probably the strangest batter I've ever worked with, so if you find the same thing, you are not alone. The ratio for Pate a Choux is 2 parts water: 1 part fat : 1 part flour : 2 parts egg. You start by boiling the water, salt, and butter together, then you add the flour to make a strangely shiny paste. After it cools for a minute or two, you add the eggs in, which causes it to separate into a rather unappealing mess of lumpy dough and runny eggs. It looks horribly wrong for a few minutes. Be patient. Somehow, after you mix it for another few minutes, it starts to shrink and come together (albeit reluctantly). And then, before your eyes, it turns into batter. A few lessons I learned from the trial and error this month. Whatever you do, do NOT open the oven door while these are baking or you'll be watching them sadly deflate before your eyes. Make the custard the day before you make the eclairs so it has enough time to set. Try to make larger eclairs so there will be enough room in them to hold the custard. And the final lesson? Enjoy. Definitely enjoy. 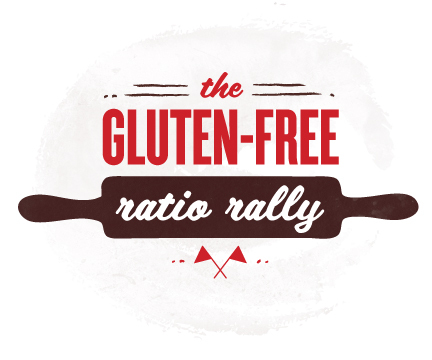 For a list of all of the other fantastic Pate a Choux creations, visit The Sensitive Epicure, our host for the Ratio Rally this month. I followed a recipe I found on the Brown Eyed Baker's blog, but halved it for the number of eclairs this recipe made. The only changes I made were to substitute So Delicious Original Unsweetened Coconut Milk for the half and half and Earth Balance Butter Sticks for the regular butter. I also made half of mine maple-flavored by adding another 1 1/2 tsp. maple extract. Prepare the custard a day ahead of time and chill in the refrigerator until ready to use. Cover with a sheet of saran wrap if possible to avoid it forming a pudding skin on top. Note: Because many of you may be new to pate a choux batter, I highly recommend taking a look at The Brown Eyed Baker blog, which has a fantastic set of pictures that take you through each of these steps. Measure and mix the rice flour, tapioca starch, and cornstarch together in a small bowl. In a saucepan (preferably a copper-bottom or one that distributes heat evenly), bring the water, Earth Balance, salt, and sugar to a low boil. Turn off heat and add the flour; stir rapidly to mix together. When it is all incorporated, return the pan to low heat and continue to stir, kind of smushing it around the pan, for another 2 - 4 minutes. It will look kind of glossy and shiny and may still have a few lumps in it. When the butter starts to separate out (it will start to coat the bottom of the pan in little beads), remove the pan from the heat. Transfer to a mixing bowl and let cool for a few minutes. Not too much, though, as you want it to be warm-hot, but not so hot that it scrambles the eggs. Using an electric mixer, beat the flour mixture on its own for about 1 minute, then add the eggs slowly to the mixture. You will probably think something has gone horribly wrong at this stage. But it hasn't. The batter will look like it won't accept the eggs, and lumps of flour may remain. Keep mixing for another 3 - 5 minutes, and it should turn into a real batter. If you want to be fancy, you can scoop all of the batter into a pastry bag or even a plain baggie and squeeze it into the shape of long eclairs. Or, you can just use a spoon to shape them. Either way, spray a sheet of parchment paper with cooking spray and shape the dough into 8 - 10 eclairs. Place them in the oven at 425 F and set the timer for 10 minutes. After 10 minutes, reduce the oven temp to 350 F and continue to bake for another 20 minutes. Whatever you do, do NOT open the oven during this time!! Remove from oven and pierce them with a knife. Allow to cool completely. When they are cool, fill another baggie or pastry bag with the custard you made ahead of time. Cut a small hole in one end of the eclairs (they should have puffed enough to have created a little enclave on the inside for the custard). Pump each one full of custard. I filled half of these with vanilla custard, and half with maple, and they were both wonderful. Go with your gut on that one. For the ganache, melt together the chocolate chips and So Delicious Coconut Milk Cream in a small saucepan or even in the microwave. Spread evenly over the top of each cream puff. If desired, dust with powered sugar. These are best eaten within a day or so of being made, but will survive for up to 3 days in the fridge. Want to see what the other creative folks in the Ratio Rally came up with? Check them out below or visit Erin at The Sensitive Epicure, who was our host for this month's wonderful Ratio Rally challenge!